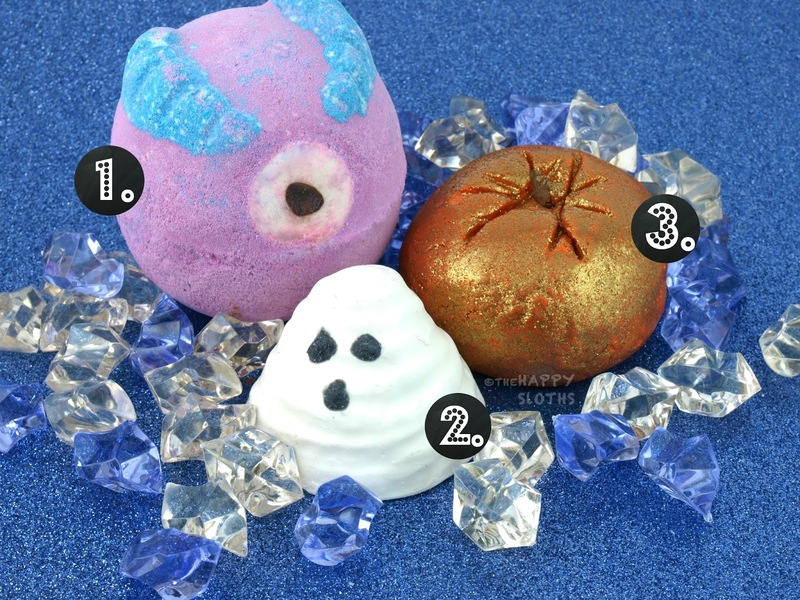 Shaped liked a pink and blue cyclops, Monster's Ball is a huge bath bomb scented with oils of lime, neroli, and frankincense. The product fizzes into a pink and blue slurry and the smell makes everything super fresh and fruity! A cute little nub of bath melt made of cocoa cutter, oils of bergamot, geranium, and ginger, Boo doesn't bubble but instead turns the bathwater slightly milky, conditioning and nourishing the skin every step of the way. The product smells citrus and gingery so it is very invigorating and refreshing. I kind of wish the product was just a tad bigger so it can last more than one go. Returning yet once again, this Lush Halloween classic is formulated with oils of juniper berry, grapefruit, and lime. Completely covered in a layer of super fine gold shimmers, this pumpkin-shaped bubble bar will make your bath super sparkly and refreshing. Simply crumble under hot running water; the Sparkly Pumpkin is good for at least two baths (or one crazy bubbly one).